It seems like we end up going on about one cruise per year. While they’re not for everyone, if you’re looking to see a lot of places in a short amount of time, we recommend them. While we’ve generally found ourselves cruising on Carnival Cruise Lines due to pricing and availability, we were able to try Celebrity Cruise Lines when we went to Alaska. We were pleasantly surprised at how different this experience was. 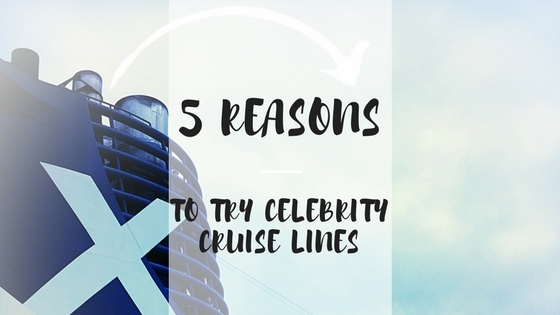 If you’re considering trying Celebrity Cruise Lines, here are 5 reasons why you should book that ticket! One of the first things we noticed about the Celebrity Solstice is that it was fancier than other cruise lines we have been on. This fact set the tone for our cruise. Overall, they cater to a different demographic. Like… the same demographic that frequents the Ritz Carlton. They’ve thought of everything on this ship – from the solarium enclosed pool, fleece blankets on deck, to a large library, the amenities are top notch. The level of luxury appointment is apparent in the decor, the staff interactions, and more! This ship holds about 2800 guests and – crew. Although this is smaller than many of the larger capacity vessels, it still is like a small floating city. The Solstice never felt crowded, lines were almost non-existent, and people seem to always have enough room to move freely. There were also only a few kids on the ship. So, if you’re looking for time away from the kiddos you might want to consider Celebrity. If you are hoping to bring the kids along, they are more than welcome on the ship, but may have more fun on other lines where there are other kids and more activities for them. Plenty of room at the main pool! From the time in the Alaskan fjord to captain’s presentation, guests have the opportunity to learn a lot while on board. They make sure there is always something going on and there are plenty of opportunities to learn something new. They also have some environmentaly focused programs including international conservation efforts and onboard naturalists. Guests can even watch a hot glass blowing show on the deck’s upper lawn. On other cruise lines, guests can watch hairy chest contests, proving Celebrity is a step above. There were several times where I found myself enjoying a good laugh from experiences we haven’t had with other cruise lines. From the captain asking for navigation help from Siri to an off-color illusionist, there were a lot of funny moments on this ship. Even the cruise director told a few people who were easily offended to leave, and they did! They missed out on the inappropriate jokes! I think some of the sense of humor must be due to a mostly adult crowd. Many of the other shows were a higher caliber than what we have seen on other cruise lines. Actual interaction opportunities with friendly staff for meet and greet. This is the only cruise we have been on were we have had so many opportunities to interact with the staff. And, I’m not just talking about the waiters and bartenders… I’m talking about the ship’s officers! There were plenty of times guests could mingle with everyone from the housekeepers to the captain, ask a range of questions, and really get a sense of an elevated level of treatment. I was able to spend some time visiting with the HR Director about her career path as well as my future goals. I never would have had that chance on other cruise lines. We had a great experience on this line – what a great way to see Alaska! If you’re considering a cruise that caters to a different crowd, look into Celebrity! We found the pricing to be comparable and it was great to change up the experience a little too! Alaskan cruises are on many people’s bucket lists. If it’s not on yours, CLICK HERE for reasons to add it now! If you’ve already booked your Alaskan cruise CLICK HERE for the best shore excursions you must try!! Need more cruise inspiration? CLICK HERE for our page full of cruise travel information! Love cruising? Why not PIN THIS POST for later! P.S. This post contains affiliate links. If you click on one and make a purchase, I might make a little extra spending money, at no extra cost to you. Love the pictures! What a beautiful ship. The last picture of the man pouring several drinks at once is amazing! That must definitely take some practice. Glad you like the pictures! Did you notice that each drink is a different color?! Skills!! Great reasons to try Celebrity Cruise Lines. I was thinking of using them to take a cruise to Alaska. I especially like how the staff does a meet and greet with the staff and of course the awesome Bartender. The one that can mix and pour all those drinks. lol. Pinned for later use and will check out the shore excursions. Lovely! The swimming pool looks so inviting! I don’t do cruises, but this definitely looks like a good choice for all my friends who love cruises. Maybe I should try and cruise – i would really struggle to relax but it sounds like there is a lot going on on board so maybe I would find stuff to keep me occupied!. Wouldn’t mind some sunshine and a swimming pool right now either! We are so busy each day in the various ports that we are exhausted at night and usually crash. But, there is a ton to do on many modern ships! And yes, the sun and pools are always nice! Wasn’t it an amazing ship? Where did you cruise to?